Shaunae Miller was accused of cheating after she dived over the line to beat USA’s Allyson Felix to gold in the 400 metres. Debate raged on Tuesday among athletes and experts about the ethics of using the technique to win a race, although the Bahamian insisted she tripped and there was no intention to gain an advantage. Felix, the reigning world champion over one lap, did not have her finest race but was closing on Miller down the home straight and looked set to just edge ahead as the final centimetres of track ran out. 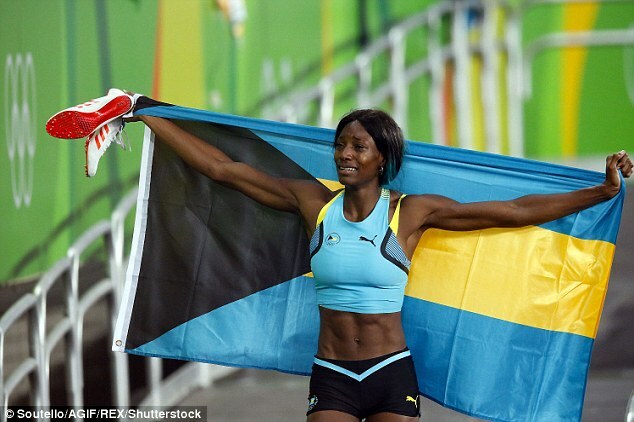 But Miller, 22, threw herself over the line to clinch victory in a photo finish. 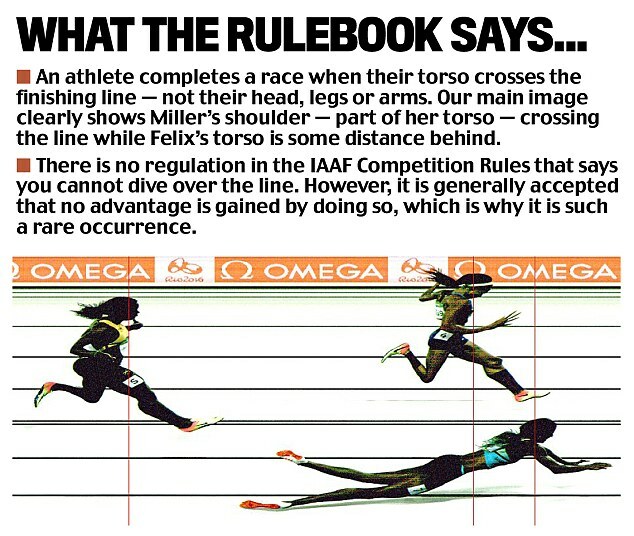 The rules state that placings are determined on whose torso crosses the line first. 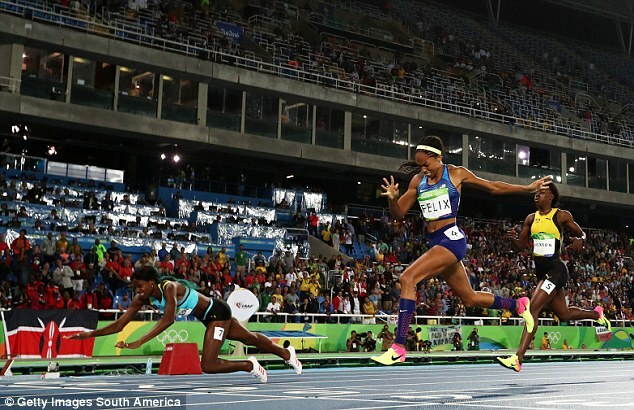 Even if it was a deliberate dive, Miller would not have contravened the rules but, bloodied and bruised afterwards, she said she could not remember the winning moment. 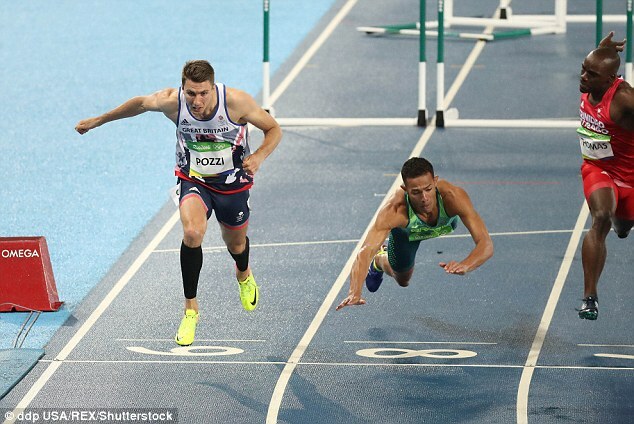 Miller, a former world junior champion, was awarded the victory in a personal best time of 49.44sec. 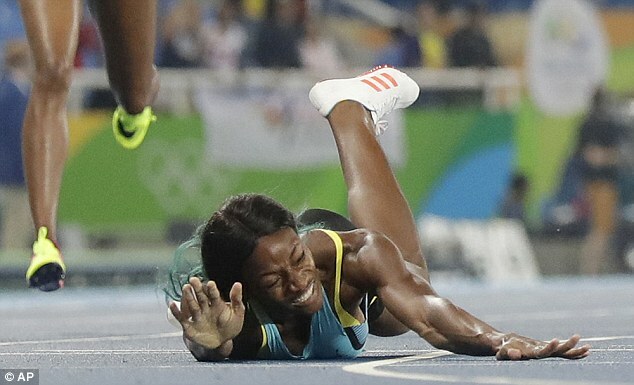 She spent several minutes afterwards lying on the track as a smiling Felix went to offer her congratulations. ‘It’s such an amazing feeling,’ said Miller. Sportsmail understands athletics’ governing body, the IAAF, will review the rule but it is thought it will not lead to a change. 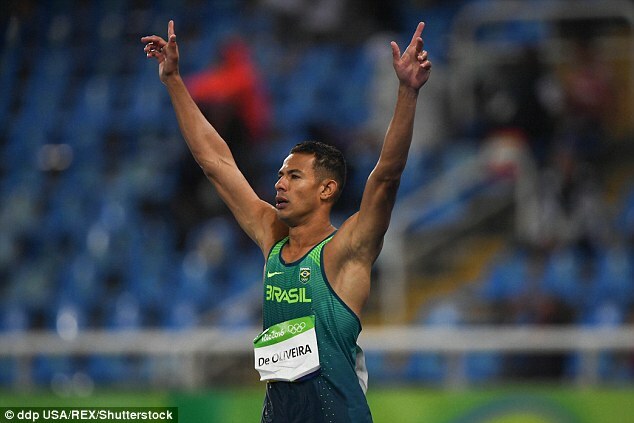 But earlier in the night Brazilian 110m hurdler Joao Vitor De Oliveira had assured his place in the semi-finals by diving across the line to finish in the first four in his heat. He made no attempt to disguise his methods. Felix’s elegant running style and easy stride make her one of the most watchable athletes in the world and one of the biggest stars. She had planned to go for a historic 200m and 400m double but did not even have the opportunity to defend her Olympic title over the shorter distance after she was beaten at the US trials in June. 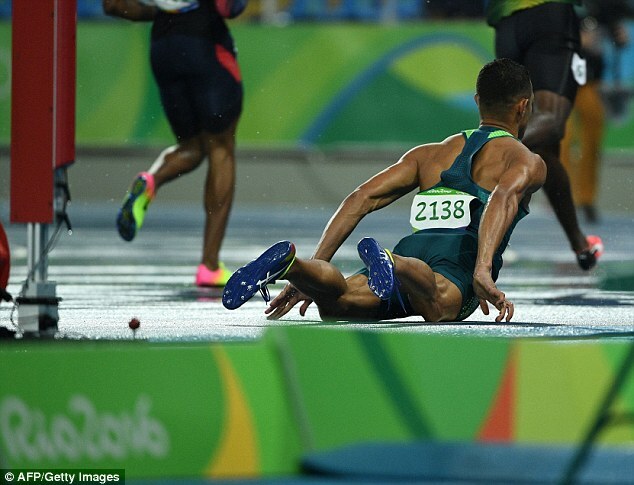 She was defeated in similar circumstances on that occasion as her compatriot Jenna Prandini tripped over the line, but she also said it had been unintentional. 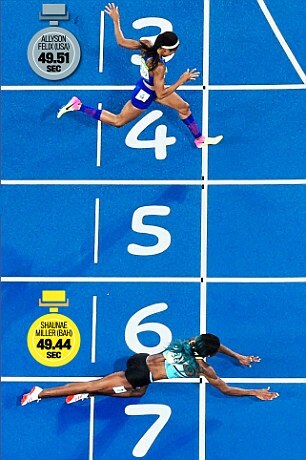 Nevertheless the silver was her seventh Olympic medal, pushing her ahead of Jackie Joyner-Kersee as the most decorated American athlete in history.